Go to http://learnhololens.com/controller and enter to win a HoloLens Edition Xbox One controller! Today I launched a new membership site to teach developers how to develop for the HoloLens. I took a break from creating HoloLens demos this week to launch the site and put together this contest where I’m giving away a Bluetooth enabled Xbox One controller that will work with the HoloLens, Windows 7, 8.1, 10 and of course the Xbox One console. This is an official Xbox One controller from Microsoft. 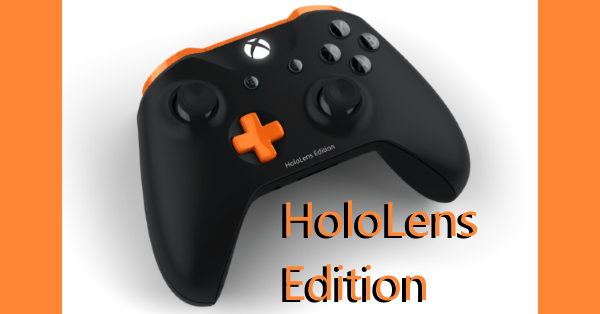 The design was made by me and the “HoloLens Edition” is not official in any way. This is not endorsed by Microsoft. I simply created a cool HoloLens Edition design and wanted to give one away! If you want a cool controller, or design your own then enter the contest and you will be given a link to this design that you could purchase if you’d like. It is $89.98 plus tax. I’m looking forward to this limited time launch of the membership site. It closes on 9/6 at midnight EST. This is an alpha launch (as in pre-beta) so it will be rough around the edges. The membership is the cheapest it will ever be. When I open enrollment again in a month or two for beta access, the price will be more. Since opening it up this evening, we’ve already seen our first several alpha members join! Once Tuesday, 9/6 at midnight EST or the alpha slots fill up the cart will close. So if you have any interest in premium HoloLens content, then don’t wait. Sign up today!